In addition to focusing on food deserts, we considered how food insecurity impacts City Council District 3 which is where NTFB is located and encompasses most of southwest Dallas. This particular area of the community as well as southeast Dallas are considered Food Deserts. In fact, the landscape is so barren of grocery stores, City Councilman Casey Thomas who represents District 3, has offered millions of dollars in incentives to encourage major grocery chains to locate stores in the district. Yet, not a single major grocer replied to the Notice of Funds Available. According to Councilman Thomas, there is a perception problem that people in south Dallas can’t afford healthy food. So without proven demand, grocers are hesitant to set up shop in South Dallas. However, we must not be misled and think food insecurity only affects those in southern Dallas. The North Texas Food Bank serves 13 counties in North Texas. Even families in some of the wealthiest counties, such as Rockwall, Collin, and Denton, struggle to put food on the table. Food insecurity affects many in our community. NTFB has programs that serve children, senior citizens as well as provides disaster relief when necessary. In fact, NTFB has out grown is Cockrell Hill facility and will be opening its new facility in Plano in August of 2018. The big picture gathered from these panelists is that there is a lack of knowledge about farming. The art and skills of farming has been lost throughout generations. However, farming doesn’t have to be a large undertaking. It can be small scale, and personal. The key elements to solve the food desert problem may already exist in the community. Unfortunately, there is a shortage of skilled farmers. More individuals need to be educated and trained on farming. There are full time farming jobs available, but people have misperceptions about what it means to be a farmer. Yet, the fact remains that farming can pay well above the median annual salary in Dallas and is indeed a STEM career. 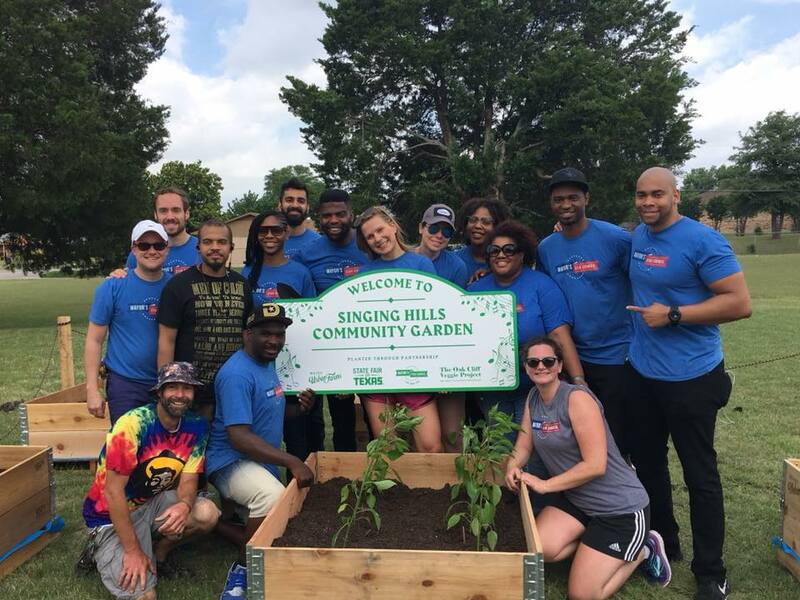 Photo: Mayor’s Star Council also participated in creating the Singing Hills Community Garden at St. Luke’s Presbyterian Church. The class built beds and planted an assortment of produce.